Photo by McTumshie from the Londonist Flickr pool. 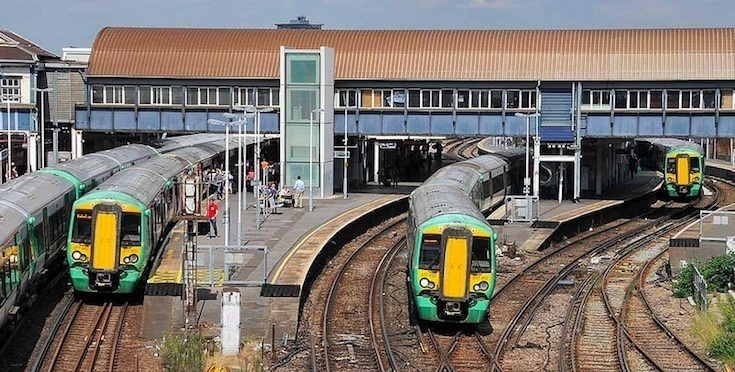 The RMT Union has announced a series of strikes on Southern rail routes for October, November and December. The strikes concern a long-running dispute with operator Govia Thameslink's decision to change conductors' jobs so they're no longer in charge of opening and closing doors. The union says that task is vital for safety. All strikes would be from 00.01 to 23.59 on the dates indicated. “The RMT’s desire to heap yet further travel misery on the public and affect the everyday lives of so many people is shameful. “A comprehensive and fair offer has been on the table for weeks and the union leadership’s claims about jobs, pay, safety are trumped-up make believe. This scaremongering by the RMT union is a contrived attempt to gain public support when it knows its spurious arguments about jobs, pay, accessibility and safety have been demolished by independent experts and analysis and are falling on deaf ears. “As a responsible operator, our priority is to make our services more accessible, not less, and we will not be shaken in that commitment. We care deeply about those of our customers who are less mobile and help thousands of elderly and disabled customers week in, week out, to travel with us. We will do everything we can to ensure those needing help getting on and off our trains receive our care and attention to get them where they want to be, promptly and hassle-free.